The secret government has a new secret space unit, and it is called the JICSpOC which works in collaboration with the NSA and the CIA. The unit was created by the Pentagon last October and will be used for Martial Law and World War 3. It is painstakingly evident that space is the new domain of the modern military. Such domain will be used against humanity, and will house weapons, satellite-based tracking, and predictive intelligence technologies. The real estate known as space is already inhabited by hundreds of satellites; owned and operated by the “Secret” Cabal. Defense Secretary Carter, is behind the coining of this “new” unit. The Pentagon chief said Thursday that the new Joint Interagency Combined Space Operations Center established by the Defense Department last fall has a role not only in preparing for potential conflicts against rival countries but in counterterrorism. The center was created after a years-long debate to integrate space operations with the workings of conventional military units and intelligence agencies. According to Carter, the earth-based command center, is carrying out minute by minute “no-kidding” operations. These operations are supposedly for conflict scenarios and counter-terrorism for the fight against ISIS. However, ISIS is an arm of the US government, in cooperation with Mossad, so the unit cannot be used against ISIS, which means that the unit is being used for something else. The real question is what are these units actually for? Given the fact that both Russia and China have the ability to operate in space as well it is quite interesting that Carter claims “space is considered a sanctuary where military systems could operate without interference.” When in reality, both Russia and China can shoot down the satellites. The other angle is hacking, the satellites can easily come under cyber attack from both countries and easily be brought out of orbit. So again the real question is what are these units for? Because they are not for the prescribed conflict scenarios with governments engaged in war. They are also clearly not against ISIS because the US government operates and controls ISIS. It is more plausible that the satellites and the JICSpOC unit are used for espionage against Americans and others around the world. The technology made available to modern militaries would allow these satellites to see every movement made on Earth from above, giving the perfect “hawk-eye” angle to track individuals. It is probable that this “secret space unit” is to a degree an arm of the NSA, as stated above. Such units will play a vital role upon the declaration of Martial Law, because of the fact that the satellites can see just about every movement made. 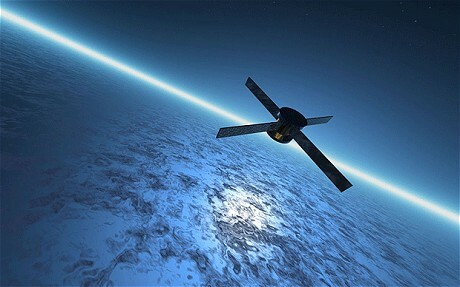 The satellites, given the right operating algorithms, will also play a vital role in prediction-based technologies and warfare. Many believe that only tracking satellites exist in space, but since the Cold War there has been a race to get weapons into space; regardless of the treaty the US and Russia signed in 1967. The idea of space-based weapons has been around since Nazi Germany, and it will play a big role in the near future.